and some of the features that make it such a versatile tool. After grinding, the point of the tool will be an angle of approximately 80 degrees. 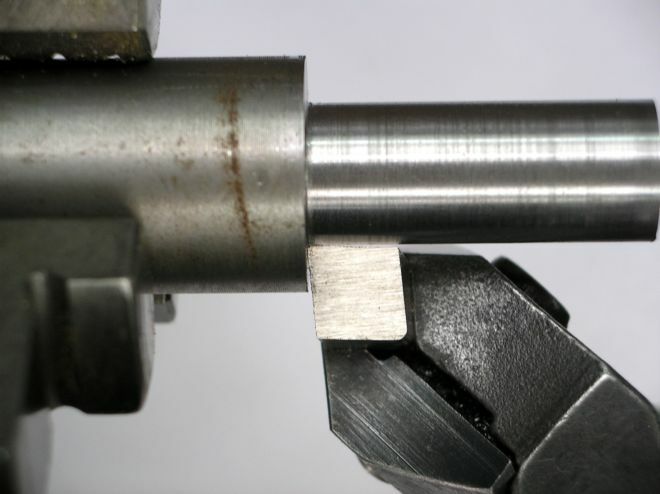 This will give 5 degrees clearance on either side of the tool-bit allowing machining into a corner or step in one operation without having to rotate the tool-post. 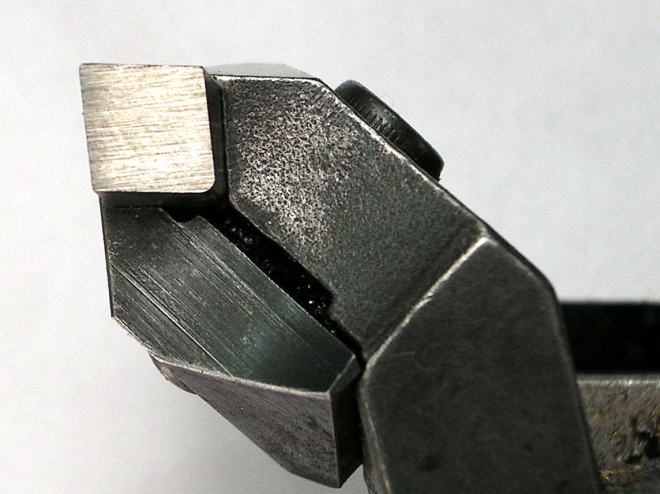 As previously stated, the tip can be ground to a 55 or 60 degree angle for screw-cutting. This is accomplished using the "V" groove in the front of the grinding jig along with the clamp screw which is used to jack the jig up or down to obtain the correct angle. Detailed instructions on sharpening normal and screw-cutting tips are supplied with the kit. 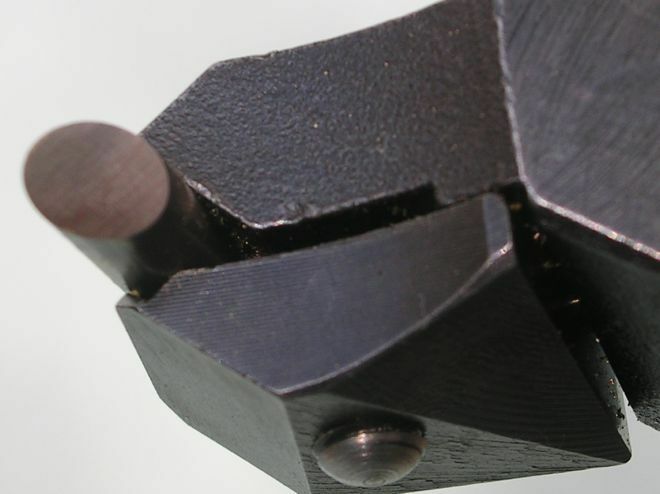 The holder will also accept 1/4" or 5/16" round High Speed Steel (depending on which holder is purchased) enabling the Diamond Tool Holder to be used as a round nose tool. The grinding jig will sharpen this too, and of course the radius will stay the same however many times it is resharpened. 1. 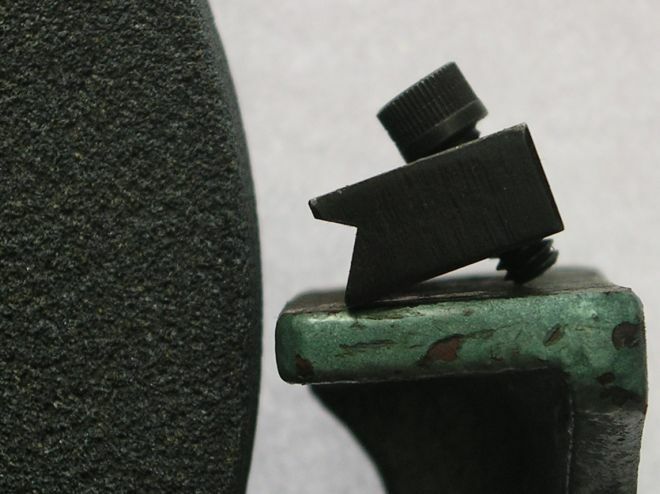 For roughing or heavy cutting, it's best to rotate the tool-post so that the tool point is trailing. This will take some of the load off the point. For finishing cuts set the tool so that the point is leading, but make sure there is clearance behind. 2. In the case of a severe jam, the tool-bit will normally be forced down into the holder avoiding serious damage to the workpiece and tool. In normal circumstances, the tool-bit will not slip, even under heavy or intermittent cutting. 3. Putting a small radius down the front corner of the tool-bit will improve surface finish and increase the durability of the cutting edge. Once the radius is set it will stay the same despite multiple re-sharpening. Handy for sets of loco wheels etc where you want the same radius each time. 4. 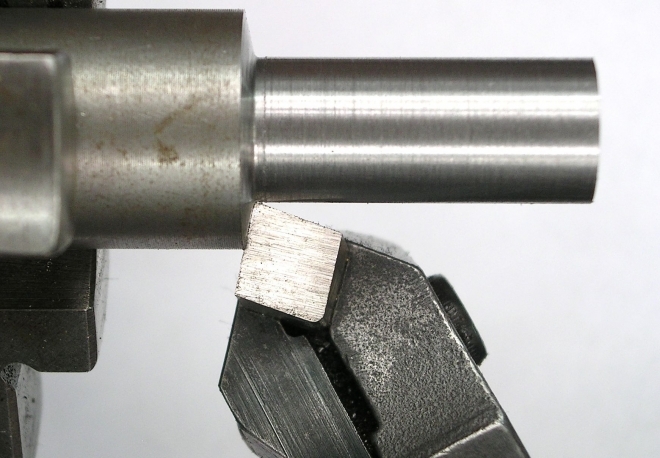 To save on HSS, the tool-bit can be ground on both ends . With say, a radius point on one end and a sharp corner on the other. Just turn the tip over for a different profile. 5. A small diamond hone, available from most hardware/DIY stores, is ideal for putting the radius down the front corner of the tool-bit. 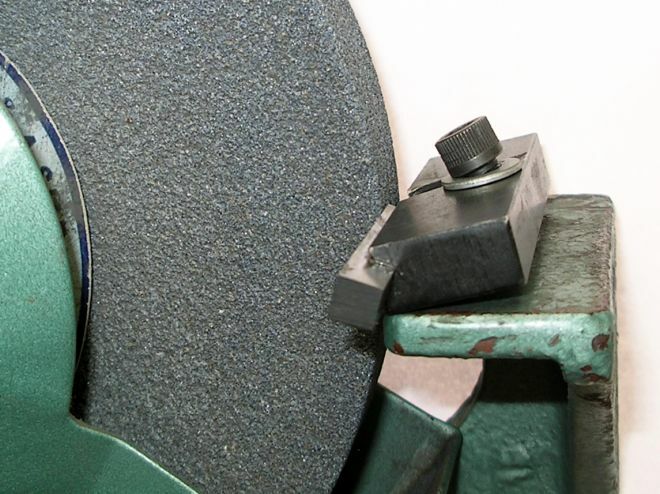 A normal sharpening stone can be used but be careful not to wear grooves into it. 6. The Diamond Tool Holder can only be as good as the piece of HSS it is holding. Each tool is supplied with one piece of M42 grade, 8% cobalt HSS, from a reputable manufacturer. Don't be suprised if you don't get the same performance from a piece of cheap HSS that you bought at the Sunday market. 7. Try and have about 6mm of tool-bit protruding above the holder. 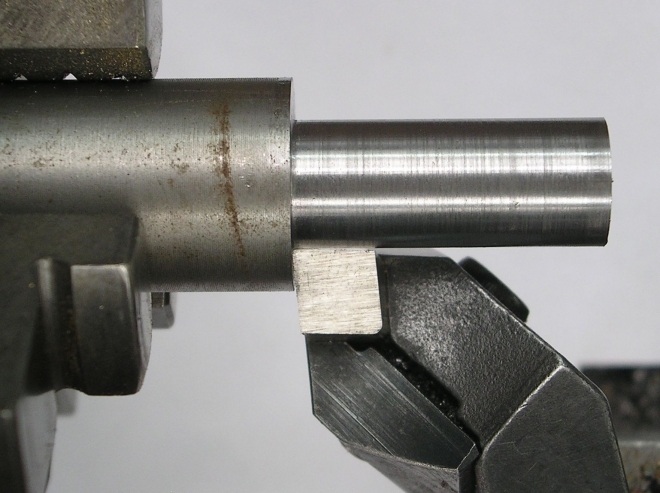 If the tip is too low, you will lose clearance between the body of the holder and it may rub on the workpiece. If the tool-tip is set too high you will start to lose some rigidity. It is better to put a piece of packing under the holder to get it close to centre height, then use the tool-tip for final adjustment. 8. Never grind the toolbit too short. Always ensure the tool-bit is long enough to protrude through the bottom of the holder. The clamp can be severely damaged if there is a jam up and the tool-bit has been ground too short. A cheap source of round HSS is broken or blunt centre drills, #3 drills are 1/4" diameter and #4 drills are 5/16". Grind off the flutes on the bench grinder or cut them off with an angle grinder, then finish off with the sharpening jig. Dont forget to leave the drill long enough to protrude through the bottom of the holder (see above). Normal twist drills are unsuitable as the shanks are soft, but broken 1/4" shank end mills are fine.